An OK start for THE PASSAGE. 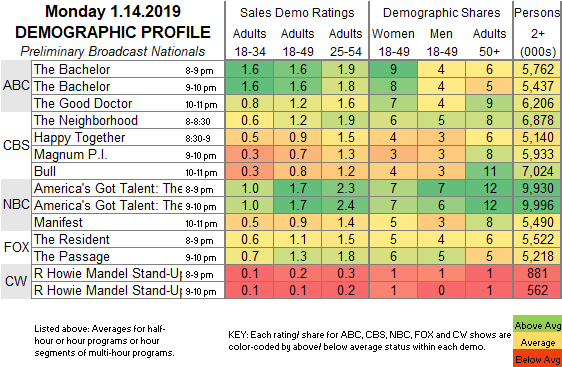 FOX: THE RESIDENT aired a new episode for the first time since November 26, and gained 0.2 to 1.1. Despite that lead-in, THE PASSAGE premiered at 1.3, down 0.1 from 9-1-1’s last score in that slot. ABC: THE BACHELOR rose 0.1 to 1.6. THE GOOD DOCTOR aired its first new episode since December 3, and dropped 0.2 to 1.2. CBS: THE NEIGHBORHOOD rose 0.2 from December 17 to 1.2, and HAPPY TOGETHER was up 0.1 from last week to 0.9. 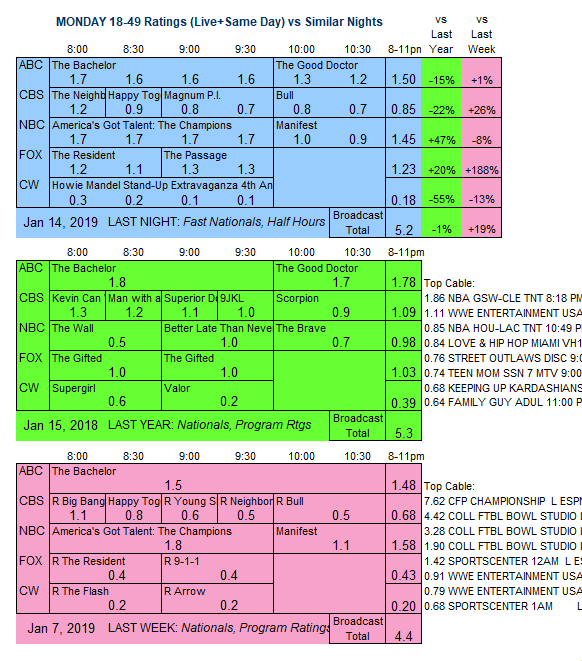 The dramas aired new episodes for the first time since December 10, with MAGNUM PI down 0.1 to 0.7, and BULL steady at 0.8. NBC: AMERICA’S GOT TALENT lost 0.1 to 1.7, and MANIFEST fell 0.2 to a new series low 0.9. CW: A HOWIE MANDEL STAND-UP EXTRAVAGANZA special was at 0.2. Tonight, CW launches its rebooted ROSWELL, NEW MEXICO.